We are excited to announce the launch of a new design for IMDbPro name, title, and company pages. The new interface not only makes it easier to find information but also simplifies navigating the many sections within the page. At the top of each page you will now find a summary of the key information about the name, title, or company. In this top summary section, we provide links to more detailed information elsewhere on the page. This makes it faster and easier for you to find IMDbPro member exclusive information. 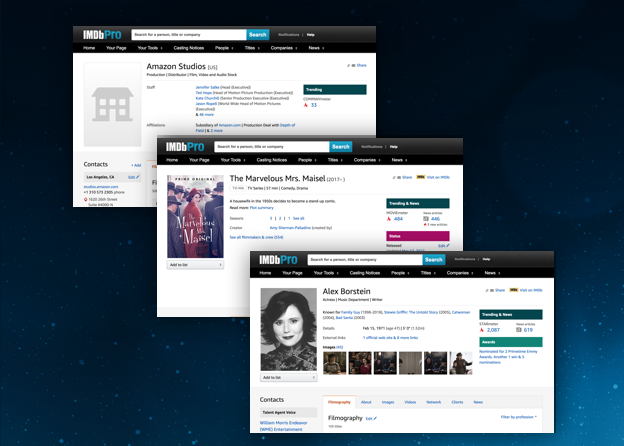 Information about name, title, and companies are organized under tabs in our new design. This allows you to quickly navigate between sections without the need to load a completely new page. Related data items are now also re-organized to appear within the same tab. For more information, you can visit our help pages around data on name, title, and company pages. You can find the representation, affiliations, or contact information for each page directly underneath the top summary section on the left side of the page. On the bottom of each page you can find popularity and trending details including detailed STARmeter, MOVIEmeter, or COMPANYmeter charts as well as other relevant popularity information depending on the page type you are on.